For more than one thousand years at the Bay of Bengal in Mahabalipuram stands the Shore Temple. Most likely this is the last of the legendary Seven Pagodas – other temples have been inundated under the sea and destroyed by terrible tsunami long ago. 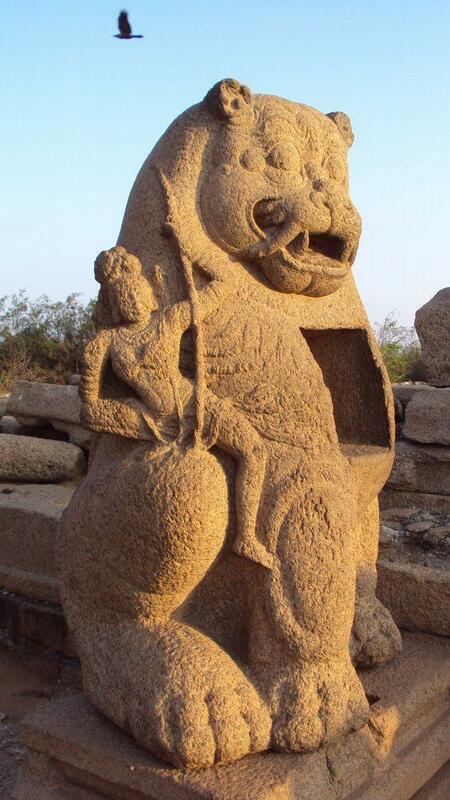 Pallava dynasty ruled in South India for more than six centuries, from 275 to 897 AD. Many amazing works of art and architecture were created in their kingdom, especially during the 7th – 8th century: Pallava kings were praised for their support to arts and education. 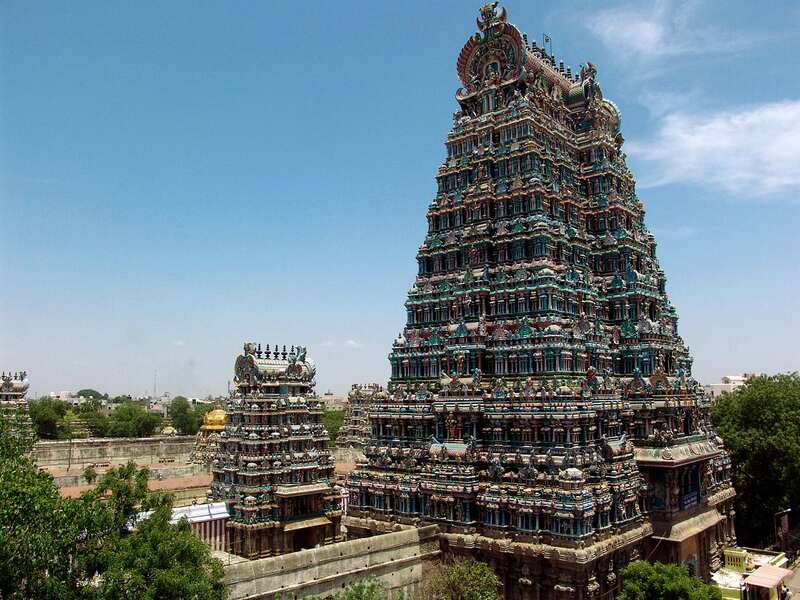 The capital city of Pallavas – Kanchipuram – was a splendid, ancient city with beautiful temples. 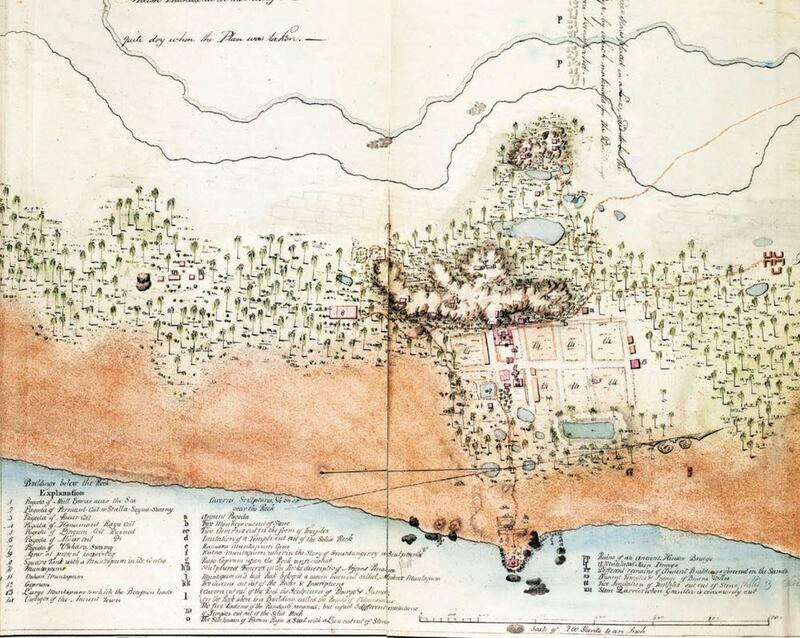 But Kanchipuram was not at the sea – and sea trade was one of the main sources of the wealth and influence of Pallavas. A large part of this wealth went through Mahabalipuram or Mamallapuram – a port city some 60 kilometers from Kanchipuram. Mahabalipuram was established in the 7th century, although port and smaller settlement existed here already some centuries earlier. According to the chroniclers of these times, the wealth of Mahabalipuram was incredible: ships were laden with valuables up to the point of breaking and gemstones were traded in heaps. Much of this wealth was invested in exquisite architecture: one after another in Mahabalipuram appeared sophisticated temples. At first, in the 7th century these temples were cut in rock – such as Krishna Mandapam or the mysterious and beautiful Yali Mandapam – Tiger Cave. From live stone were created Pancha Rathas – five gorgeous structures, a true wonder of the world. 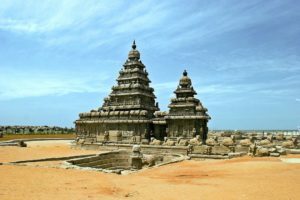 Of course, these structures were built in places where a live stone was available on the site – there is a large hill of monolithic granite in Mahabalipuram with cave temples on its slopes. Live granite in Mahabalipuram is also under the soil – in some places artisans created sculpted structures in artificial recesses. Nevertheless, such an approach limited the possibilities of architecture: for example, there was no possibility to build tall structures. In the 8th century, the architecture and structural engineering in Mahabalipuram (and whole South India) changed. Artisans started to build structures from massive blocks of granite. To the amazement of local people and faraway traders, tall towers of new temples rose in Mahabalipuram. 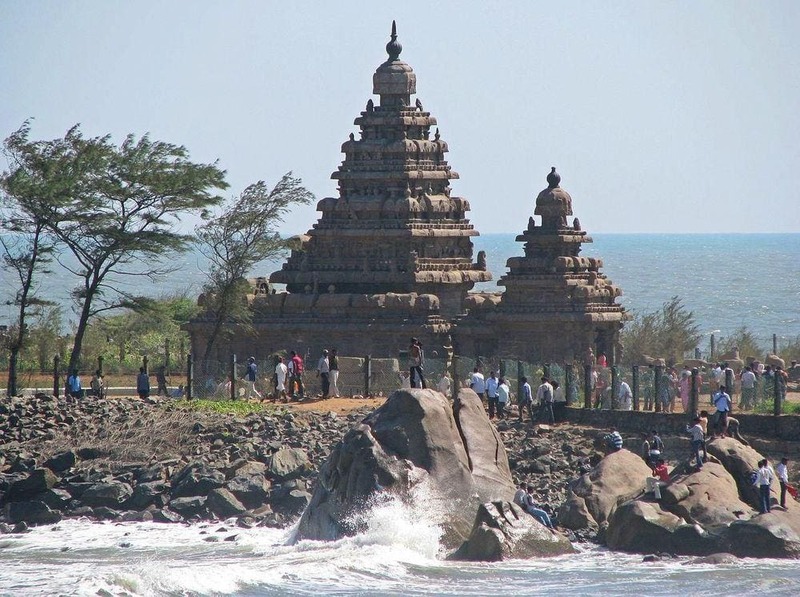 One of these towers was the present day Shore Temple – one of the oldest structural temples in South India, a sample of true Dravidian architecture. Most likely this comparatively tall temple was built near the sea with the intent to leave an impression on the guests, it could help also for the navigation. 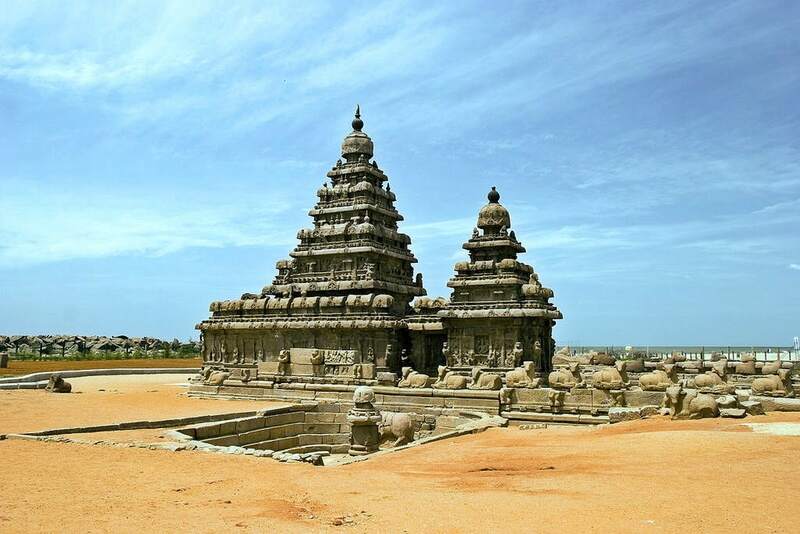 The temple is a culmination of the wonderful structures in Mahabalipuram which were built during the reign of Narasimha varma II – one of the great Pallava rulers who reigned in 700 – 729. This building left a profound influence on the architecture of South India. Kshatriyasimhesvara – the main Shore Temple – is the largest structure, 18 m high and 15 m wide, with five floors. This temple is devoted to Shiva. It faces east and rays of morning Sun are lighting the Shiva Linga inside, in the garbhagriha of this temple. This linga is work of art: 1.8 m tall, made from basalt and adorned with sixteen faces. Another important work of art is Somaskanda – a bas-relief depicting the family of Shiva with his wife Parvati and child Kartikeya (Subrahmaniya). Narapatisimha is smaller temple in the middle, dedicated to Vishnu. This could be the oldest part of this complex, an important part in the history of Mahabalipuram. According to a legend, prince Hiranyakasipu refused to worship Vishnu. His son Prahlada, in turn, was devoted to Vishnu. As he said to his father that Vishnu is present everywhere, Hiranyakasipu kicked the pillar of the house. At this moment Vishnu emerged from the pillar as a man with lion’s head and killed the prince on site. Prahlada became the new king and his son Bali founded Mahabalipuram on this site – thus Vishnu has special importance for the city. Rajasimheswara is the third temple, devoted to Shiva. This planning, most likely, symbolizes the attempts to balance the diversions of Hinduism. Around the temples is a wall which is topped with sculptures of Nandi as well as Yalis and Varahas. This wall has been carefully restored during the 20th century. Inside the enclosure is also an incomplete sculpture of a lion with a small sculpture of Durga on its back. Next to these three temples is also a recess – carefully shaped well with a sculpture of Bhuvaraha (incarnation of Vishnu) in the middle. 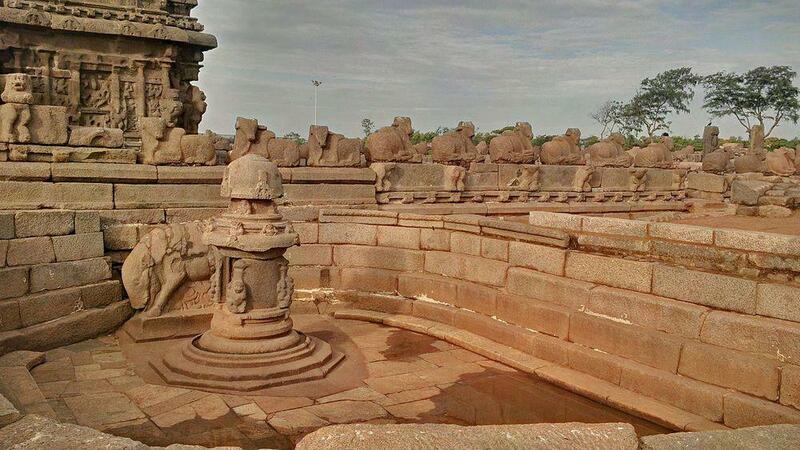 The sculpture is older – shaped around 640 – 660 AD, while the well was made at the same time as Shore Temple. In order to protect this temple from waves, there is built a system of wave-breakers around it by the Archaeological Survey of India. In December 2004 the tsunami inundated the base of the temple for a while but it did not damage it although there were damaged some sculptures around the temple. In front of the temple every year during December – January takes place a festival of traditional dance – Mamallapuram Dance Festival. Seven Pagodas… where are six of them? Seems, no one knows for sure who was the first to mention Seven Pagodas of Mahabalipuram, but, most likely it was one of the European traders who reached the city in medieval times. Reportedly, the travelers who approached Mahabalipuram from the sea were amazed by a group of seven tall, gorgeous temples. Today only one of these “pagodas” stands – the Shore Temple. What happened with the other six temples? It’s a mystery… almost. 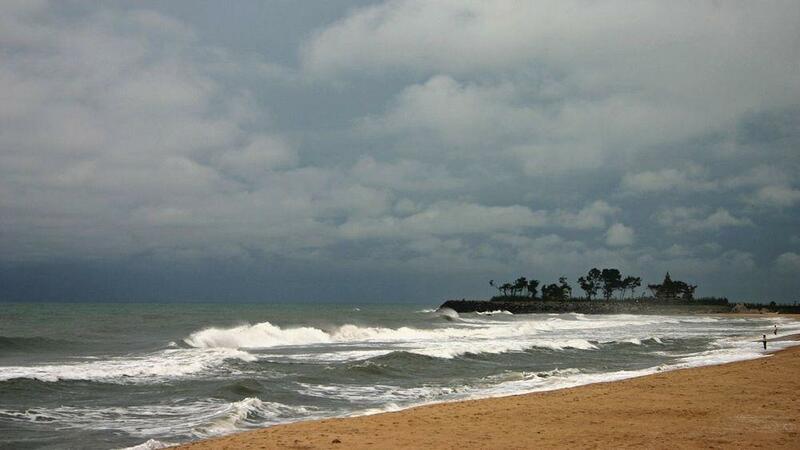 According to a local legend, Indra, god of rain and storms was enraged by the beauty of Mahabalipuram. Indra flooded and submerged most of the city during a terrible storm and only one temple was left standing at the sea. Seems, there is truth in this legend – local fishermen always knew about ruins under the water near Shore Temple but scientific community became convinced about this in 2002 – 2004 when researchers found remnants of some structures near the temple. In December 2004 before a devastating tsunami sea receded for some 500 meters and exposed a long, straight row of large rocks – and then the terrible wave came. After the waves appeared some more wonders of the past – a large sculpture of a lion (7th century AD), half-completed relief of an elephant and others. Further research testified: in the sea near the existing temple are remnants of more temples which have been destroyed either by the sea or earthquakes and now are under the sea level. Most likely Seven Pagodas were destroyed around the 13th century AD by a tsunami – there are traces of this catastrophe along India’s East Coast. Sailendra Nath Sen. 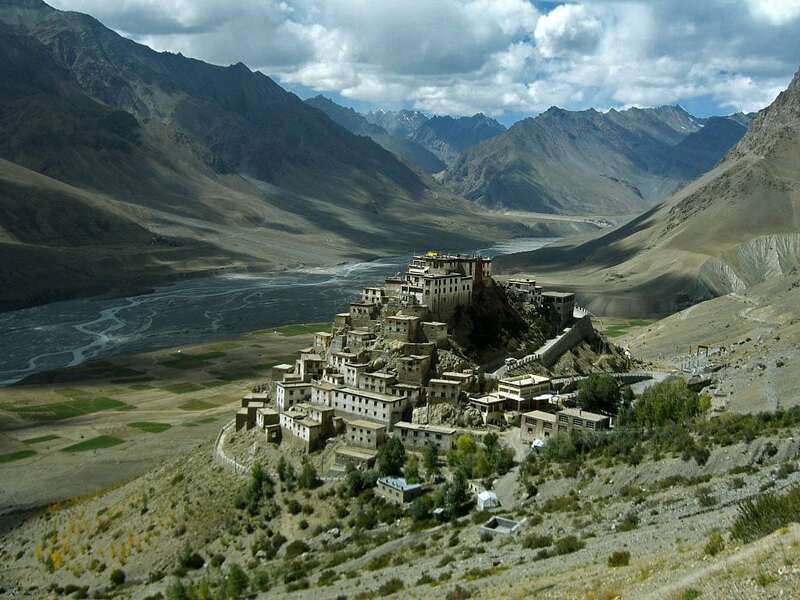 Ancient Indian History and Civilization. New Age International, 1999. ISBN: 8122411983. Bijay Kumar Das. Temple Architecture in India. Lulu.com, 2018. ISBN: 1387486772. J. W. Coombes. The Seven Pagodas. Asian Educational Services, 1999. ISBN: 8120614240. Swati Das. Tsunami unveils ‘seven pagodas’. The Times of India, February 25, 2005. Accessed on February 4, 2019.